A creamy and comforting side dish your whole family will enjoy after a busy and stressful day! 1. 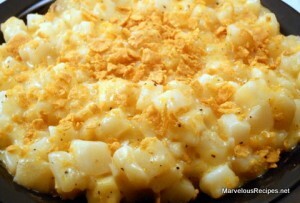 In a large bowl, combine hash browns, soup, milk, cheese, 1/2 cup butter, onion, salt and pepper. Pour into a greased 5 quart slow cooker. Cover and cook on Low for 4-1/2 to 5 hours or until potatoes are tender. 2. Just before serving, combine cornflake crumbs and 1/2 tablespoon butter in a pie plate. Bake at 350 degrees F for 4-6 minutes or until golden brown. Stir the potatoes; sprinkle with crumb topping. Yields 10-12 servings.